Chelsea goes on leading the pack and stay unbeaten after eleven Premier League matches this season. The Blues were able to give rest some key players during the break including Diego Costa who didn’t play for Spain. Mourinho managed to win all five home matches this year and will do his best to maintain this momentum. West Bromwich will make the hard trip to West London. The Baggies managed to win their last three fixtures on the way but Chelsea will provide an important test of the club’s credentials. West Brom’s Berahino has caught the eye of different top clubs this season and he is sure to become the target of some larger Clubs in winter. Chelsea will maintain their crazy start to the Season by the comfortable home win. Everton have been fighting to get going the Season and at the very moment they are 10th in the Barclay’s Premier League standing. Two wins on seemed to kick start the Season just before two draws followed. Everton will host the Hammers looking to move back to winning road on the coming Saturday. West Ham have enjoyed a fabulous start of the Season and now they occupy 4th place. Big Sam’s side stays unbeaten in five League matches and will provide Everton with quite strong game. Baines suffered a slight injury but is still expected to appear in this fixture. Lukaku and Valencia are very likely to score for the respective sides. Leicester are the Club in a free fall at the very moment. They have lost 4 consecutive Premier League games not scoring a single goal. As a result, Nigel Pearson’s side nows stay on the 18th place in the Standings just before Gameweek 12. The Black Cats are the next team to visit The King Power with the hope of keeping Leicester on their losing way of form. Sunderland enjoyed a tremendous 3:1 victory at Crystal Palace the last time they managed to play a Premier League match on the way. Gus Poyet will surely star forward Steve Fletcher to expose a very weak Leicester defense which has leaked a lot of goals. Sunderland win is expected. Man City only managed to get a draw when the team visited QPR last Gameweek and saw Chelsea FC extend their leadership at the Premier League top. Sergio Aguero was on target 2 times for City and goes on to be the best marksman in the Leagues. City have beaten The Spurs and Man United in their last 2 League games at their stadium and they hope to make it even 3 wins in a row after Swansea visit. Swansea have been one of the great surprises of the Season and now they occupy 5th place in the Table before Gameweek 12. They have fought away from their home lately and are still have no wins in 4 attempts on the road. We expect a home win. Alan Pardew has made a fabulous turnaround in Newcastle’s fortunes. They were really fighting and Pardew under the pressure before winning four League games to come into the top half of the League table – staying just ahead of Liverpool and Everton. Newcastle host the R’s next and will fancy their chance of getting a 5th win in a row. Redknapp’s side will make a long trip North after getting one point against the Champions Man City in the previous Gameweek. The Rangers have to sort out their form far away from home as they have lost 5 road matches in the League. Newcastle is sure to pick up three points. Stoke enter Gameweek 12 staying in the top half of the League table due to their tremendous 2-1 away win at Tottenham Hotspur last Gameweek. Stoke have been quite solid at home in recent matches taking 7 points from at The Britannia Stadium. Burnley finally managed to pick up their first win in the EPL following a very hard 1-0 win over Hull City in the previous match. Sean Dyche’s side hopes to make up on such a foundation and get at least one point from their journey to Stoke. Mark Hughes hopes his side are able to see off a potential Relegation candidate. They hope to maintain the unbeaten streak at home. We expect a Stoke City win. 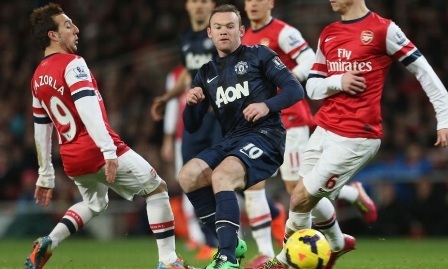 In the pick of the new gameweek Arsenal will host Man United. Wenger agrees that his side are not able to catch the leader Chelsea and create any title challenge this year after the defeat at Swansea last Gameweek. Arsenal are already 12 points away and are playing to secure a Big Four finish and Champions League next season. Man United have been in quite a decent form at the home stadium but they also have continued to fight on the road in recent gameweeks. Alexis will be eager to test the strength of MU’s rearguard who will be playing without Rafael, Evans, Jones, Rojo and De Gea. The Emirates will see a home win. Crystal Palace are not far from the Relegation Zone after 4 defeats in 5 League away games. The Eagles have to pick up a number of points before they were able to find themselves just in the very bottom of three. The Break must have given the Eagles the chance to re-group somehow and create a way to take advantage of a fighting Liverpool side. Liverpool could get only one point in their previous 3 encounters. Rodgers has been the target of a very great deal of criticism for providing rest key players in the game with Real before losing their home game against the Blues the following Saturday. Dan Sturridge could appear in this game at some moment as Liverpool has a lack of attacking variants. In this game we may expect a score draw. Hull City earned the disappointing honor of becoming the first EPL team that lost to Burnley in this season. Bruce needs his side to collect themselves immediately before the visit of Tottenham on Sunday. Hull City have lost 2 of the last 3 at The KC and a win could put them towards mid-table. Tottenham fans are losing their illusions with the way their side is being run. Poor results have seen Tottehnam lose 3 of their last 4 matches. So, we expect away win in the match. Aston Villa could finally end their losing streak and held West Ham to a zero draw at Upton Park. Paul Lambert hopes his side can revitalize following this result but Southampton FC are in great form before visiting Villa Park. They have won 4 matches keeping 4 consecutive clean sheets. Koeman has done a wonderful job at St Mary’s in spite the departure of key players during the Summer. Villa could only score one goal in their last 3 home matches and Southampton hopes to keep one more clean sheet at Villa Park.